Sometimes people just need to believe in magic because it’s right in front of their eyes! 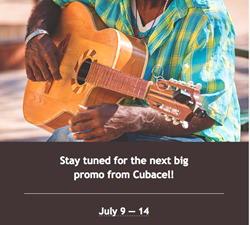 Here is an example: this Cubacel promo, hosted by HablaCuba.com starting on July 9 and staying 6 days (3x2, obviously…) and offering 30 CUC (3x10, there!). And that’s not all! On HablaCuba.com, the Cubacel promo is preceded by a contest that offers... 3 prizes! All customer have to do is to share not 1, not 2, but 3 things they miss from back home. Not necessarily things, but people, pets, places, whatever comes up to their mind when they think of Cuba! The promotional balance may be used for all services available to prepaid users like domestic and international calls, SMS, MMS, including SMS entumovil and Data (Nauta). The promotional bonus will expire on August 5, 2018 at 23:59 Cuba time. Top ups of 40 CUC or more will be divided into 2 or 3 separate top ups, so that you receive the maximum bonus possible. The recharges may arrive several minutes apart.